The great anticipation surrounding President Barack Obama‘s long overdue visit to Indonesia on November 9-10 ensured that it would be one of the most watched stops on his recent Asian tour. After domestic political issues in the U.S. forced the cancellation of two planned visits earlier in 2010, the confirmation that Obama‘s visit would finally take place promised to satisfy an Indonesian public that had waited nearly two years for Obama‘s return to his childhood home. Even volcanic ash from nearby Mount Merapi that threatened Obama‘s ability to reach Jakarta, and shortened the visit to less than 24 hours, could not diminish the significance of the occasion. But after so many delays, would Indonesians still be receptive to Obama‘s overtures? While news coverage preceding Obama‘s visit featured anecdotes about his four years living in Jakarta and interviews with former childhood acquaintances, speculation had grown about whether Obama‘s return to Indonesia had exhausted the patience of a once eager public. In a capital that considers the U.S. president “a local boy made good,” there were suggestions that the repeated postponements of his visit had dampened enthusiasm for his return. 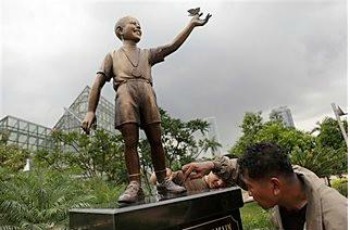 Workers make finishing touch on the bronze statue of young U.S. President Barack Obama at a park in Jakarta, Indonesia. The statue was later moved to a school attended by Obama in his youth. President Obama attended Santo Fransiskus Asisi, a Roman Catho-lic school, as a child. © The New York Times. November 8, 2010. At the same time, evidence of “Obamamania” among Indonesians only reinforced the perception of huge anticipation for the visit. An Obama trivia contest organized by the U.S. Embassy in Jakarta drew more than 12,000 entries and had 10 contestants compete in a televised reality show for a chance to win a trip following in Obama‘s footsteps to Hawaii, Chicago, and Washington, DC. In another sign of the immense interest in the visit, the number of Facebook fans for the U.S. Embassy grew by more than half to nearly 280,000 in the 48 hours surrounding Obama‘s visit. Recent public opinion data has also shown that the majority of Indonesians (67%) still have confidence in Obama to do the right thing regarding world affairs, slipping only slightly from 71 percent the previous year. By some accounts, with just a few lines in his University of Indonesia speech Obama managed to largely defuse skepticism that may have developed during the repeated postponements of his visit. His articulation of his own “homecoming” to Indonesia in Bahasa Indonesian earned enthusiastic approval from the crowd of several thousand in attendance and positive coverage from the Indonesian media. But from another perspective, the focus on Obama‘s special ties to Indonesia overshadowed coverage of other aspects of his address to the Indonesian people, which holds implications for the future of U.S.-Indonesian relations. 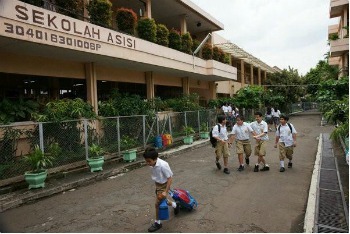 Schoolchildren in Indonesia eagerly await President Obama‘s November visit to Jakarta. Although U.S. relations with the Muslim world were not the focus of Obama‘s visit to Indonesia, they remain a prominent underlying theme whenever the U.S.-Indonesia relationship is discussed. Some coverage of the visit encouraged Obama to use the trip to acknowledge Indonesia‘s potential as a strategic regional partner, highlighting its strides toward more stable democratic governance and promising economic growth, while others focused on the chance to deepen relations with “an ally in the fight against Islamist extremism.” How Obama will choose to utilize his immense popularity in Indonesia in order to advance U.S. interests will remain an important topic of discussion going forward. Obama‘s ability to capture the interest of the Indonesian public and media has demonstrated that his special relationship with Indonesia is an asset for public diplomacy in the long-term, but only if it can be translated into a foundation for U.S.-Indonesian relations that moves beyond Obama‘s personal appeal. Ultimately, the future of U.S. public diplomacy toward Indonesia will greatly depend on Obama‘s ability to shape the direction of the U.S.-Indonesian cooperation on issues from countering extremism to balancing China‘s regional influence while Indonesians are still willing to give him their attention. Melanie Ciolek is a candidate for a Master of Public Diplomacy at USC. She received her B.S. in Foreign Service in International Politics from Georgetown University in Washington, D.C. in 2005. Her studies focused on the foreign policy process, multilateral institutions, democratization, and Latin American politics. Prior to arriving at USC, Melanie worked for four years at the Program on International Policy Attitudes (PIPA) in Washington D.C., a global public opinion research think tank which manages the WorldPublicOpinion.org project. She most recently held the positions of communications coordinator and survey manager for the WorldPublicOpinion.org network surveys, which cover more than 25 countries.